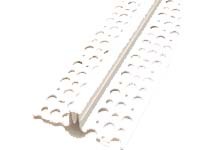 “M” type expansion provides mechanical keying to stucco membrane, ideal for one coat systems. Designed to relieve stress in the stucco typical shrinkage and thermal movement. Carton and pallet sizes vary.